We are now in one of my favorites times of the year, the dark time, where we can find stillness and we may be able to enjoy the quietness. I admit it can also be a bit hard, as we lack daylight and the weather can affect our mood, but I really enjoy the Yuletide as it is, for me, a time of sweet nothingness. As soon as I think about the Winter Solstice, I also think about the Wild Hunt, and about the tales, the myths, that are connected with it. I was always fascinated by this legend, but it also left me a bit confused. One aspect of the Wild Hunt, is that dangerous, fearful approach to it, how the Hunt will take you against your will, or as it may take loved ones with them. On the other hand I also feel that wild and pure energy, and really just energy, not judged as bad or good. It is a feeling of getting ready and pure excitement, and it is up to you how this energy will turn out for you. Didn’t I just described the Yuletide as a time of stillness? Yes, exactly, for me this really is a time of both opposing energies, first the quiet time, where you just take a step back from work, responsibilities, and nowadays social media, but also a time where you get ready for a new cycle, where you may get enthusiastic about the new things you want to do. The time of Samhain is often related to a time of reflection, thinking about the past year, deciding what needs to be left behind, but as the Winter Solstice approaches I really want to be done with that, and enjoy my time of doing…well nothing really, just getting excited about the possibility that soon I will be doing something in the near future, something new, something wonderful, a whole new cycle of opportunities that did not exist before. That naive thinking that we can start fresh, and hey, it fulfills me with bliss. However, as it is my YouTube Anniversary today, I wanted to do something special for my channel and for all the people who watch my videos. As a Tarot Reader how to better acknowledge the Wild Hunt than to create a Tarot Spread that relates to it. 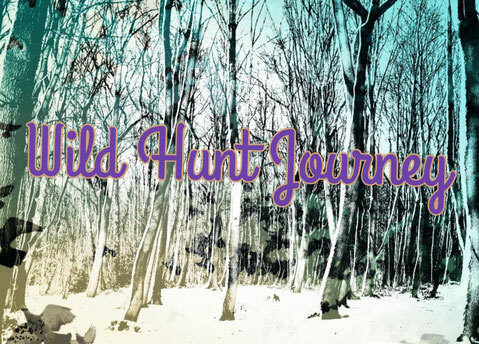 But as I’ve created spreads before and shared them, I also wrote a guided journey with the Wild Hunt, and I honestly think that both, the spread and the journey combined, may give you a deeper understanding of yourself, and of the spirit of this time of the year. Please know that this comes from a pagan perspective, or from an angle that celebrates the wildness within, if that’s not your cup of tea, know that I fully respect other pathways and feel free to ignore me. The journey will guide you on a passage through the darker realms, by dark I don't mean bad, just more hidden, and at times the oppressed aspects of our human selves. This journey can help you to connect with this side of yourself again and will also give you the opportunity to leave behind negative patterns that may hold you back. What could that be? For example a bad habit, like smoking (don’t worry I don’t judge I was a smoker for many years),spending to much time on the cellphone, constantly procrastinating, or feelings of envy, feelings of anger that are not handled with care, the list is really endless. My negative pattern for example is that I am overly critical with myself, I’m never pleased with myself, it doesn't matter what I do, and I think many people can relate to this problem. This disapproving of Self can be a huge block, and at this time I really have to release this. I will explain the positions shortly here on my blog, but you can also take a look at my video if you prefer that. 1. Where in my life do I need to take the lead again? I chose this question mainly because, I felt that I lost all control about what happened during the past months. At this point I have to address the Wildness of the leader of the Wild Hunt, what can I learn from him? By the way I’ve got The Fool, which was a bit of a „in your face“ answer, but I needed to hear this. The Fool shows me wonderfully, how little I actually participated in my own life lately. I was scared to engage in my life, as I was always afraid that the next bad thing will happen any minute now. This is a reminder to trust in life itself again, to be free of worry, not to stress myself about preparations I need to take, but to just simply be, and engage in the next adventure and find my innocence again. 2. What needs to stay behind closed doors? The legend of the Wild Hunt tells us that it is important to stay inside during this time, not to cross the Wild Hunt, as they could take you with them. Better to shut your doors and let them pass. This question was important for me to ask, because sometimes we just need to shut something down for a while. That doesn't mean we don't need to deal with it at a later point, but for now it is hindering us. Here I’ve got the Warrior Seven ( Seven of Wands). This card tells me that, the feeling that I had lately, to constantly defend myself, and thinking that the world is against me, was a bit of an over-emotional reaction. I need to let this go right now, I’m probably not ready to deal with this problem on a deeper level at the moment, so set aside for a while and come back to it when you are ready to address this issue. Right now it is just hindering me, and like the tale of the Wild Hunt it just instills fear that is not a rational one. 3. In what area of my life can I allow myself to be wild again? This is about the other side of the Wild Hunt what I was talking about. The excitement and the pure and wild energy that we need to invoke from time to time in our very civilized life. Here I’ve got the Dancer Princess (Page of Cups). I need to express myself in a creative way, without overthinking, without criticizing myself, or judging my creations. In the last year I had little time to really engage in my creativity and to just let it run wild and free. I had a lot of work, still do, but I really need to set some time aside to work on my creative projects. Allowing myself more time to write, draw, sew and so on. I love to create, I constantly do, but I took on to many responsibilities that I wasn't able to do those things. By the way, those responsibilities are entirely my own choosing, and I could ignore them without hurting anybody, so yes, the blame is fully on me. The unicorn is quiet important in this image, unicorns stands for innocence and purity, and there I will find my Wild Self again. 4. Where can I find stillness ? Let’s bring balance in this spread, so before we talked about the wildness, which is definitely a more action based card, and now we take a look at the passive side. As I mentioned earlier in this blog post, I love this time of sweet nothingness, taking a time out and to just simply be. I’ve pulled the Maker Ten (Ten of Pentacles). Very clear response; I will find that much needed stillness in my home, with my family, those people (and pets) who allow me to simply be myself, where I don't have to worry about my behavior, or about being judged by my actions or inactions. My home will be my safe haven, where I can allow myself to be quiet and to do nothing for a while. 5. How can I stand up for myself ? Or: What do I need to sacrifice? Here I want to offer you two different questions, depending on your own situation. I chose the question on how I can stand up for myself. In some folklore stories it is said, if you meet the Wild Hunt and want to have them release a loved one they took, you should throw dirt from the path, an iron knife, or your left shoe and say : „This is yours, and this is mine!“ Now they will release the person you want. In other stories it is said in order to avoid being taken by the Hunt, or to release somebody you need to sacrifice something. So choose what makes sense to you. I’ve received the Warrior Nine (Nine of Wands), this card tells me that there is no need for me right now to make a stand. I am well prepared, and more importantly well protected. It relates again to card number two, where it says already I need to set that idea, that I have to defend myself all the time, aside. I am safe, and I can feel free to just sit back and wait. 6. What shadow aspect do I need to work on ? 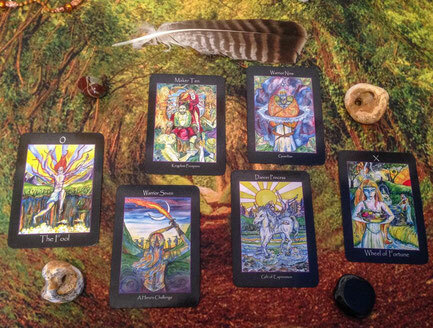 This card relates more to the journey that comes with this spread, and you can see it as a bonus card. I’ve pulled The Wheel of Fortune. This card really hits the nail on the head. The Wheel of Fortune Card is stalking me for a while, and it was present in a lot of readings that I’ve done before. This year was at times pretty rough, and this card turned up a lot, before some specific events. I’m not going to go to much into detail, but all those events were not in my control and it is just those kind of things that you have to live with it, if you want it or not. However it also made me think a lot about fate and destiny, and self blame. No wonder it turns up in the shadow aspect. I also have to understand that I don’t have to feel sorry for myself, but to make the best out of the situation. I did already, I had an intense ritual at Samhain, about releasing all the things in the past. I get a better understanding of the cycle, and that some things are just necessary. I have the feeling that things are improving and I look forward to a new cycle with lots of new ideas, and that I finally listen to my own advice.